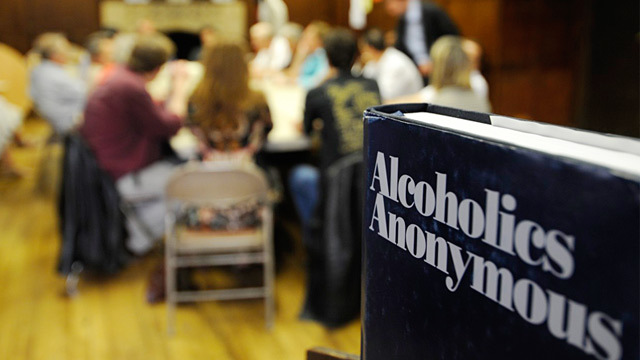 The "Big Book," the basic text for Alcoholics Anonymous, is shown during a group meeting in this June 5, 2010 photo. In what a government attorney calls the first case of its kind, the Philadelphia office of the SEC has charged five people with making more than $1.8 million illegally through insider trading of stocks. The SEC is claiming that the violation of trust and confidentiality required to prove insider trading occurred between members of Alcoholics Anonymous. "What we're saying, here, is that the two shared a relationship of confidence and trust, beginning at the time they both started to attend A.A. in 2009," says Elaine Greenberg, associate director of the SEC's Philadelphia Regional office. The two men's relationship extended beyond A.A. For example, they occasionally trained together for triathlons, according to the SEC, and routinely shared confidences about their personal and professional lives. But, says Greenberg, their relationship of trust was heightened by A.A .
Never before has the SEC tried to use as proof a shared membership in A.A..
Jennifer Arlen, professor of law at NYU and specialist in securities fraud, says the Supreme Court long ago established there's nothing illegal about someone trading on material, non-public information. "What's illegal," she clarifies, "is to trade on it in breach of a fiduciary duty to someone, or in breach of some similar relationship of trust and confidence." Might that include the especially trusting relationship encouraged between members of A.A? One of the group's founding documents, "Twelve Steps and Twelve Traditions," warns members against breaking trust or violating confidentiality. It makes no distinction between confidences shared in meetings, and others shared outside. In this case, says the SEC, the insider information was illegally obtained just after the two men attended an A.A. meeting together in July 2008. The PHLY executive confided in McGee that he felt he was under terrible pressure to bring his company's confidential merger negotiations to a successful end—so much pressure that he feared he might resume drinking. McGee questioned him about the deal, then bought stock in PHLY. Later, when the merger was publicly announced, he made a $292,128 profit when shares shot up 64 percent. McGee had also allegedly tipped his co-worker Zirinsky to the merger. Zirinsky likewise bought stock, using his own account plus those of his wife, sister, mother and 89-year old grandmother. He allegedly tipped his father and a friend in Hong Kong, who, in turn, passed the tip along to others. The SEC now is seeking disgorgement from this group of $1.8 million in "ill-gotten gains," plus penalties. No action is being brought against the unnamed PHYL executive. Paulo Lam and Marianna sze wan Ho, two parties named in the SEC's suit, have already paid and settled, without admitting any wrongdoing. Zirinsky's attorney, Richard Levan, asked by ABC News for comment, declined. McGee's attorney, John Grugan, did not respond. Paul Johnson, a spokesman at Ameriprise Financial, said in a statement: "We fully cooperated with the SEC on this matter and conducted an internal review. We have strict rules related to the use of material, nonpublic information and have suspended Mr. McGee ad Mr. Zirinsky."